Is the Robinson College of Business career expo offering enough actual careers? Can Georgia State’s J. Mack Robinson College of Business recruit better for its students? Robinson holds a career expo every year in both the Spring and Fall semesters. The Expos feature employers from a number of different industries searching for future employees and offering internships. The Robinson College of Business serves as a prestigious with their recent ranking as No. 45 among the most productive business schools in North America. However, not all students are impressed with the selection of employers who attend the Expos. Senior computer information systems (CIS) major Nik Fuller attended both the Fall 2012 expo and the Spring 2013 expo. Fuller said Georgia State should maybe have a separate job expo for students looking for part-time jobs, if they plan on having that many jobs at the expo. “It’s called a Career Fair. 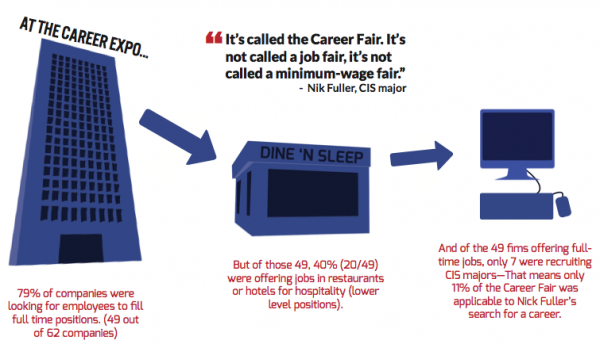 It’s not called a job fair, it’s not called a minimum wage fair,” Fuller said. Aldrich also explains that they often have employers who are interested in specific majors, but not others. “In this case, it appears a restaurant was most likely recruiting students from our School of Hospitality.” Aldrich said. Fuller plans to have a career directly after college…Not a bridge job that will support him while he searches for his true calling. Many of the employers at the fair Fuller described would not provide a stable job, or provide the average income that a graduate from Robinson receives. To the college’s defense, a fair amount of the firms at the expo, even the lesser quality companies, are there to offer internships for students. Fuller complained that Georgia State’s risk management and CIS programs are both ranked among the top ten programs of their kind in the nation. He is puzzled as to why we don’t have big Atlanta-based companies like Georgia Pacific (GP) or Suntrust at those expos. According to Aldrich, Robinson invites over 10,000 organizations annually, and that participation by companies is a reflection of the current job market. Some of the onus can be placed on the fact that if a firm doesn’t need it employees, it’s just not going to pursue new candidates. That’s not to say Fuller is completely out of place making his claim. Do a quick search of “Computer” and you’ll find a handful of entries. But if you were to look at the companies recruiting CIS majors you would come to the same conclusion that I have, they’re not “careers” as the name Career Fair would lead you to believe. Ex: Pappas restaurant is looking for people to fill their MIT program. Sounds cool? 4-months rotation ” is a 4‐month process that involves exposure to many different positions in the restaurant including server, door host, bartender, kitchen prep and more.” Great. Glad that’s what GSU thinks of my top 10 degree program. Why does GSU waste time bringing in part-time jobs, ones without relevant work experience, to the career fair? Is this what they think their degrees are worth?